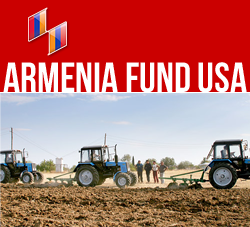 NEW YORK, New York — The Armenia Fund continues to carry out major development projects in Armenia’s Lori Region, the latest being the reconstruction of the community center of the village of Artsni, launched this past February and financed by the Fund’s Montreal affiliate. Concurrently, the reconstruction of Artsni’s school is now underway through the sponsorship of the Indian government and slated for completion imminently is the gymnasium for Spitak’s No. 2 School, also in the Lori Region. Originally erected some 40 years ago, Artsni’s community center was in dire need of refurbishment. When renovations are completed, the two-story building will house spacious offices for the Artsni Municipality as well as an events hall and medical clinic. The latter two facilities will also serve the residents of the neighboring village of Apaven. The majority of Artsni’s 350 residents are refugees from Getashen and cattle-breeding is the mainstay of the local, rural economy. Formerly known as Kiziltagh, Artsni was given its present name in 1991.